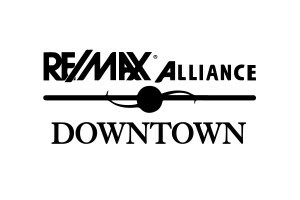 A look at the current real estate market; provided by RE/MAX ALLIANCE Downtown. With a thrilling tingle the “AHA!” moment bursts into being as wishful thought is spoken aloud. One moment in time and what wasn’t now is – an invention is born! Such was the experience of Sherman Poppen. As his daughter watched wistfully out their front window during a snowstorm in 1965, he heard her whispered wishful sigh as the snow piled up ever higher sparking Sherman’s “AHA!” moment. She wished to go surfing….in the snow! Deciding to make his little girls dream come true this doting father sprang into action. His wife named the resulting effort a “Snurfer” and a child’s wish became the prototype for hours of fun on snowy slopes. As the weather on the mountains cooperate to mimic those snowy slopes enjoyed by young Miss Poppen, we turn our attention to the real estate numbers from November. Colorado’s existing home sales year over year showed continued growth, up almost 4%. New home sales shot up 10.7% overall and new home starts remain encouraging. Month over month in the holiday season tends to trend downward and November has been no exception. Despite this the appetite of home buyers has not diminished as sales show they remain enthusiastic to close on and move into their new homes before the New Year arrives. 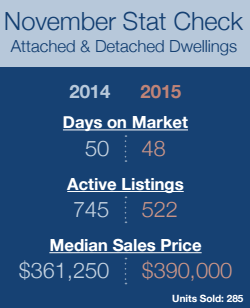 In Boulder County 285 units sold and closed in November and did so on average within 48 days of going on the market. That’s an average of 2 less days on market than 2014. Prices steadily increased as well, with a median sale price of $390,000, a jump from last year’s median of $361,250 for both attached and detached dwellings in Boulder County. These can be regarded as impressive numbers for this particular time of year, especially when you take into consideration the inventory available. 745 active available listings to choose from last year versus 522 active homes for sale during November this year. While December is historically a slower sales month, predictions for the fourth quarter sales as well as the 2015 full year sales figures is predicted to be in positive territory. Early indications of national figures, boasting increases in number of homes sold and higher average sale prices advocate that optimism. The continually rising rental costs are expected to help drive sales to heightened levels over this coming year. The optimism is indicated due to a strong job market and stable economic growth which should continue to fuel an expanding housing market as we welcome in 2016. Another good reason for optimism can be seen in that Boulder County enjoys slightly higher home price increases; 8% as compared to the 5.2% average nationally. Add to that the results from a recent NAR survey indicating 83% of renters would prefer to purchase and the optimism just knows no bounds this holiday season. As the Federal Reserve prepares to raise the short term interest rates, evidenced by Federal Reserve Chairwoman Janet Yellen stating “….economy is ripe for interest rate hike”, which will affect mortgage rates, the experts agree this holiday season may be the best one yet for including a new home in your holiday stocking. Grab your Snurfer or your gear of choice and, if you haven’t done so yet, head to the Rockies. Ski season is in full swing and the mountains are covered in lovely fluffy white. Even if you aren’t a skier, the more sedentary activity of sipping hot cocoa while watching may prove to be just as much fun! We’ll see you in 2016!